Using an Apple iPhone, a team of US scientists has developed a mobile phone microscope that rapidly detects parasite levels in blood.The team from the National Institute of Allergy and Infectious Diseases (NIAID), part of the US National Institutes of Health and University of California, Berkeley developed the device to measure blood levels of the parasitic filarial worm Loa. 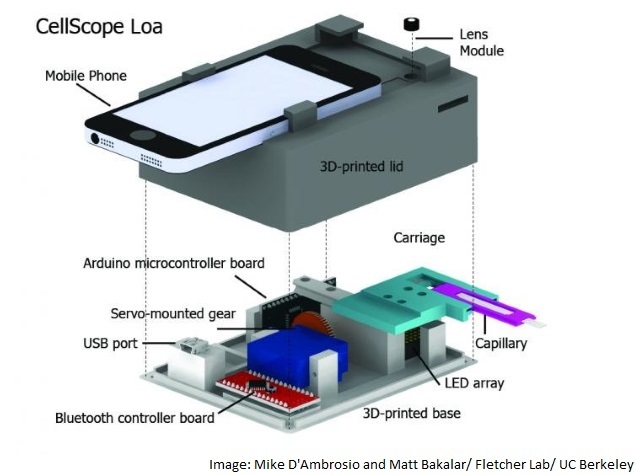 To rapidly screen for Loa infections in community settings, the scientists developed CellScope Loa, a video microscope integrating an Apple iPhone 5s. With the help of a custom iPhone app, the device automatically captures and analyses videos of the characteristic “wriggling” motion of microfilariae, enabling quantification of microfilariae in blood from a finger prick in less than two minutes. “No special preparation of the blood is required, limiting potential error and sample loss, and healthcare workers need minimal training to use the automated device,” the authors noted. The point-of-care device may enable safe resumption of mass drug administration campaigns to eradicate the parasitic diseases onchocerciasis (river blindness) and lymphatic filariasis (elephantiasis). Efforts to eliminate these diseases in Central Africa through community-wide administration of antiparasitic drugs have been suspended due to potentially fatal drug-associated side effects in people with high blood levels of Loa microfilariae, the filarial worm’s larval form. A potential solution is to identify and exclude such people from mass drug administration. “However, standard methods for measuring microfilariae are time-consuming and must be performed by trained personnel with laboratory equipment,” the team wrote. Screening of blood samples from potentially Loa-infected people showed that CellScope Loa results correspond well to those obtained by standard methods, correctly identifying people with microfilarial levels over a certain threshold. Although additional work is needed to prepare the technology for broad use, the researchers predict that a team of three workers could screen up to 200 people during the four-hour midday window when Loa circulates at its peak in the blood. The work is detailed in the journal Science Translational Medicine.